When it comes to interior design of a car there is lots of scope for improvement! Dash kits for Infiniti from Wowtrim company will enhance the style and charm of your vehicle. Real wood, wood grain, aluminum, carbon fiber & camouflage trim kits are all at your disposal. Save your time and nerves using our installation instruction. Infiniti G35 (2007-2008) / G37 (2009), Sedan, Over OEM Kit, With Automatic Transmission, Full Interior Kit, 47 Pcs. Infiniti G35 (2007-2008) / G37 (2009), Sedan, Over OEM Kit, With Manual Transmission, Full Interior Kit, 45 Pcs. Infiniti G35 2005-2006, Interior Dash Kit, Sedan, With Navigation System, With Automatic Transmission, 40 Pcs. Infiniti G35 2005-2006, Interior Dash Kit, Sedan, W/o Navigation System, With Automatic Transmission, 37 Pcs. Infiniti G35 2004, Coupe, Full Interior Kit, Manual, With Armrest, With or W/o Navigation System, 47 Pcs. Infiniti G35 2004, Sedan, Full Interior Kit, Manual, With or W/o Navigation System, 47 Pcs. Infiniti G35 2003, Coupe, Full Interior Kit, Manual, With Armrest, With or W/o Navigation System, 47 Pcs. Infiniti G35 2003, Sedan, Full Interior Kit, Manual, With or W/o Navigation System, 47 Pcs. Infiniti G35 2003, Coupe, Full Interior Kit, Automatic, Without Navigation System, 45 Pcs. Infiniti G35 2003, Sedan, Full Interior Kit, Automatic, Without Navigation System, 45 Pcs. Infiniti G35 2004, Coupe, Full Interior Kit, Automatic, With or W/o Navigation System, 47 Pcs. Infiniti G35 2004, Sedan, Full Interior Kit, Automatic, With or W/o Navigation System, 48 Pcs. Infiniti G35 2005-2006, Interior Dash Kit, Sedan, With Navigation System, With Manual Transmission, 34 Pcs. Infiniti G35 2003, Coupe, Full Interior Kit, Automatic, With Navigation System, 46 Pcs. Infiniti G35 2003, Sedan, Full Interior Kit, Automatic, With Navigation System, 46 Pcs. Infiniti G35 2005-2006, Interior Dash Kit, Sedan, W/o Navigation System, With Manual Transmission, 31 Pcs. Infiniti G35 2005, 2006, 2007, Interior Dash Kit, Coupe, With Navigation System, With Automatic Transmission, 32 Pcs. Infiniti G35 2005, 2006, 2007, Interior Dash Kit, Coupe, W/o Navigation System, With Automatic Transmission, 29 Pcs. Infiniti G35 2005, 2006, 2007, Interior Dash Kit, Coupe, With Navigation System, With Manual Transmission, 26 Pcs. Infiniti G35 2005, 2006, 2007, Interior Dash Kit, Coupe, W/o Navigation System, With Manual Transmission, 23 Pcs. Infiniti G35 (2007-2008) / G37 (2009), Interior Dash Kit, Sedan, Match OEM Kit, 25 Pcs. Infiniti G35 2003-2004, Coupe, Optional Interior Kit, 4 Pcs. Infiniti G35 (2007-2008) / G37 (2009), Sedan, Over OEM Kit, With Automatic Transmission, Basic Interior Kit, 18 Pcs. Infiniti G35 (2007-2008) / G37 (2009), Sedan, Over OEM Kit, With Manual Transmission, Basic Interior Kit, 18 Pcs. Infiniti G35 2003, Sedan, Basic Interior Kit, Manual, With or W/o Navigation System, 17 Pcs. Infiniti G35 2003, Coupe, Basic Interior Kit, Automatic, Without Navigation System, 13 Pcs. Infiniti G35 2003, Sedan, Basic Interior Kit, Automatic, Without Navigation System, 15 Pcs. Infiniti G35 2004, Coupe, Basic Interior Kit, Automatic, With or W/o Navigation System, 15 Pcs. Infiniti G35 2004, Sedan, Basic Interior Kit, Automatic, With or W/o Navigation System, 18 Pcs. Infiniti G35 2003, Coupe, Basic Interior Kit, Automatic, With Navigation System, 14 Pcs. Infiniti G35 2003, Sedan, Basic Interior Kit, Automatic, With Navigation System, 16 Pcs. Infiniti G35 2004, Coupe, Basic Interior Kit, Manual, With Armrest, With or W/o Navigation System, 15 Pcs. Infiniti G35 2004, Sedan, Basic Interior Kit, Manual, With or W/o Navigation System, 17 Pcs. Infiniti G35 2003, Coupe, Basic Interior Kit, Manual, With Armrest, With or W/o Navigation System, 15 Pcs. Infiniti G35 Sedan 2003, 2004, 2005, 2006, Stainless Steel Pillar Posts, 6 Pcs. Infiniti G35 Sedan 2007-2008/G37 Sedan 2009, 2010, 2011, 2012, 2013, Stainless Steel Pillar Posts, 6 Pcs. Infiniti G35 2003, Infiniti G35 2005-2006, Exterior Kit, 6 Pcs. Infiniti G35 Sedan 2003, 2004, 2005, 2006, Stainless Steel Pillar Posts, 4 Pcs. Infiniti G35 2007-2008, Infiniti G37 2003, Exterior Kit (Sedan Only), 6 Pcs. Infiniti G35 Sedan 2007-2008/G37 Sedan 2009, 2010, 2011, 2012, 2013, Stainless Steel Pillar Posts, 4 Pcs. Infiniti G35 2003, Infiniti G35 2005-2006, Exterior Kit, Optional Fuel Door (Sedan Only), 1 Pcs. Infiniti FX 2006, 2007, 2008, Full Interior Kit, Over Aluminum, 59 Pcs. Infiniti FX (2009, 2010, 2011, 2012, 2013) / QX70 (2014, 2015, 2016), Over OEM Wood Interior Kit, 38 Pcs. Infiniti FX 2006, 2007, 2008, Basic Interior Kit, Over Aluminum, 31 Pcs. Infiniti FX 2003, 2004, 2005, With Center Console Interior Kit, 31 Pcs. Infiniti FX 2003, 2004, 2005, Without Center Console Interior Kit, With Center Console Panels, 25 Pcs. Infiniti FX (2009, 2010, 2011, 2012, 2013) / QX70 (2014, 2015, 2016), Without OEM Wood Interior Kit, 34 Pcs. Infiniti FX 2003, 2004, 2005, Without Center Console Interior Kit, Without Center Console Panels, 23 Pcs. Infiniti FX 2006, 2007, 2008, Exterior Kit, 21 Pcs. Infiniti FX 2009, 2010, 2011, 2012, 2013, Infiniti QX70 2014, 2015, 2016, Exterior Kit, 8 Pcs. Infiniti FX 2003, 2004, 2005, 2006, 2007, 2008, Stainless Steel Pillar Posts, 12 Pcs. Infiniti FX 2003, 2004, 2005, 2006, 2007, 2008, Stainless Steel Pillar Posts, 6 Pcs. Infiniti FX 2009, 2010, 2011, 2012, 2013, Infiniti QX70 2014, 2015, 2016, Exterior Kit, Optional Front Fender Air Vent Outlet Accent, 2 Pcs. Infiniti FX 2006, 2007, 2008, Optional Overhead Console Interior Kit (FX35 Only), 8 Pcs. Infiniti FX 2006, 2007, 2008, Optional Overhead Console Interior Kit (FX45 Only), 8 Pcs. Infiniti FX 2009, 2010, 2011, 2012, 2013, Infiniti QX70 2014, 2015, 2016, Exterior Kit, Optional Fuel Door, 1 Pcs. Infiniti G20 1999, 2000, 2001, 2002, Full Interior Dash Trim Kit, 12 Pcs. Infiniti G20 1992, 1993, 1994, 1995, 1996, 1997, 1998, Main Interior Kit, 8 Pcs. Infiniti Q45 1990, 1991, 1992, 1993, 1994, 1995, 1996, Main Interior Kit, 13 Pcs. Infiniti Q45 1998, 1999, 2000, Without Navigation System, Main Interior Kit, 8 Pcs. Infiniti Q45 1997, 1998, 1999, 2000, 2001, Stainless Steel Pillar Posts, 6 Pcs. Infiniti Q45 1997, 1998, 1999, 2000, 2001, Exterior Kit, 6 Pcs. Infiniti J30 1993, 1994, 1995, 1996, 1997, Full Interior Kit, 14 Pcs. Infiniti I 1998-1999, Nissan Maxima 1995, 1996, 1997, 1998, 1999, Interior Dash Kit, With Automatic Transmission, 24 Pcs. Infiniti I30/I35 2000, 2001, 2002, 2003, 2004, Stainless Steel Pillar Posts, 6 Pcs. Infiniti I 2000, 2001, 2002, 2003, 2004, Exterior Kit, 6 Pcs. Infiniti G37 Sedan 2010, 2011, 2012, 2013, Over OEM Kit, Full Interior Kit, 46 Pcs. Infiniti G37 2008-2009, Coupe/Convertible, Over OEM Interior Kit, With Automatic Transmission, 46 Pcs. Infiniti G37 Coupe/Convertible 2010, 2011, 2012, 2013/Infiniti Q60 2014-2015, Over OEM Kit, Full Interior Kit, 45 Pcs. Infiniti G37 2008-2009, Coupe/Convertible, Over OEM Interior Kit, With Manual Transmission, 44 Pcs. Infiniti G37 Sedan 2010, 2011, 2012, 2013, Over OEM Kit, Basic Interior Kit, 24 Pcs. Infiniti G37 Coupe/Convertible 2010, 2011, 2012, 2013/Infiniti Q60 2014-2015, Over OEM Kit, Basic Interior Kit, 24 Pcs. Infiniti G37 2008-2009, Coupe/Convertible, Match OEM Interior Kit, 24 Pcs. Infiniti Q50 2014, 2015, 2016, 2017, Over OEM Kit, Full Interior Kit, 50 Pcs. Infiniti Q50 2014, 2015, 2016, 2017, Basic Interior Kit, 24 Pcs. Infiniti Q50 2014, 2015, 2016, 2017, Exterior Kit, Full Interior Kit, 8 Pcs. Infiniti Q50 2014, 2015, 2016, 2017, Stainless Steel Pillar Posts, 6 Pcs. Infiniti Q50 2014, 2015, 2016, 2017, Basic Exterior Kit, 6 Pcs. Infiniti Q50 2014, 2015, 2016, 2017 Optional Overhead Console Interior Kit, 7 Pcs. Infiniti Q50 2014, 2015, 2016, 2017 Exterior Kit, Optional Fuel Door, 1 Pcs. Infinii EX 2008, 2009, 2010, 2011, 2012, 2013/Infiniti QX50 2014, 2015, 2016, Over OEM Interior Kit, 33 Pcs. Infinii EX 2008, 2009, 2010, 2011, 2012, 2013/Infiniti QX50 2014, 2015, 2016, Match OEM Interior Kit, 22 Pcs. Infinii EX 2008, 2009, 2010, 2011, 2012, 2013/Infiniti QX50 2014, 2015, 2016, Exterior Kit, 11 Pcs. Infinii EX 2008, 2009, 2010, 2011, 2012, 2013/Infiniti QX50 2014, 2015, 2016, Stainless Steel Pillar Posts, 8 Pcs. Infinii EX 2008, 2009, 2010, 2011, 2012, 2013/Infiniti QX50 2014, 2015, 2016, Stainless Steel Pillar Posts, 4 Pcs. Infiniti M 2011, 2012, 2013/Infiniti Q70 2014, 2015, 2016, Over OEM Kit, Main Interior Kit, 36 Pcs. Infiniti M 2006, 2007, 2008, 2009, 2010, Main Interior Kit, 31 Pcs. Infiniti M 2011, 2012, 2013/Infiniti Q70 2014, 2015, 2016, Addition To Main Interior Kit, 20 Pcs. Infiniti M 2006, 2007, 2008, 2009, 2010, Exterior Kit, 13 Pcs. Infiniti M 2011, 2012, 2013/Infiniti Q70 2014, 2015, 2016, Exterior Kit, 8 Pcs. Infiniti M35/45 2006, 2007, 2008, 2009, 2010, Stainless Steel Pillar Posts, 8 Pcs. Infiniti M 2011, 2012, 2013/Infiniti Q70 2014, 2015, 2016, Stainless Steel Pillar Posts, 6 Pcs. Infiniti M35/45 2006, 2007, 2008, 2009, 2010, Stainless Steel Pillar Posts, 4 Pcs. 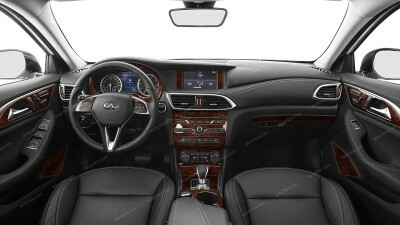 Infiniti M 2006, 2007, 2008, 2009, 2010, Optional Infiniti M45 Overhead Console Interior Kit, 6 Pcs. Infiniti M 2006, 2007, 2008, 2009, 2010, Optional Infiniti M35 Overhead Console Interior Kit, 6 Pcs. Infiniti M 2011, 2012, 2013/Infiniti Q70 2014, 2015, 2016, Optional Overhead Console Interior Kit, 6 Pcs. Infiniti M 2011, 2012, 2013/Infiniti Q70 2014, 2015, 2016, Exterior Kit, Optional Fuel Door, 1 Pcs. Infiniti QX30 2017-2018, Full Interior Kit, 35 Pcs. Infiniti QX30 2017-2018, Basic Interior Kit, 25 Pcs. Infiniti QX30 2017-2018, Exterior Kit, 12 Pcs.